“As a New Year’s resolution, I am going to make little print-outs of the web addresses of my favourite BC political bloggers. I’ll tack them on community posting-walls, leave them in coffee shops and pass them to friends or colleagues. I’ve already been sending links to friends via e-mail — but this could get the word out to new circles of people. 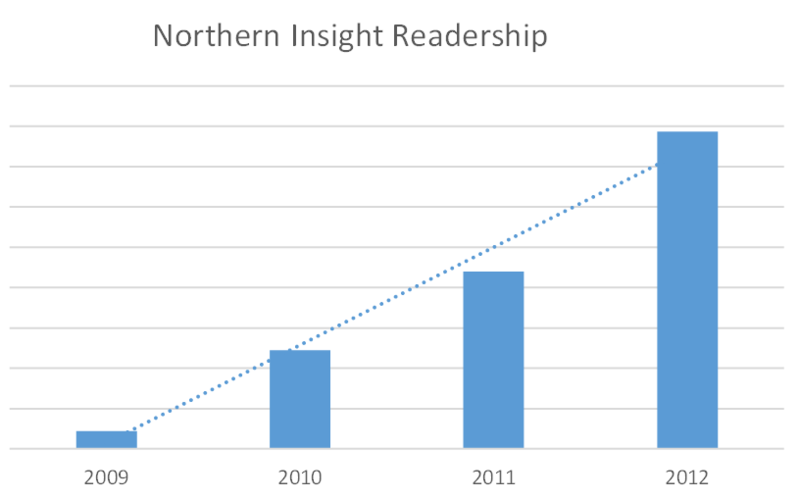 As you can see, the readership has been developing steadily and monthly readership is now measured in many tens of thousands. Any power these blogs have or might have comes from the pool of engaged readers. My aim here is not to promote one party over another, or to advance one vested interest beyond another, as the CTF, the Fraser Institute or the BC Chamber of Commerce intends with numerous paid staff. The aim here is to promote ethical principles, accountability and transparency within public institutions. My clear view is that Liberals fail on each and every element and, no matter what they say in future, they cannot be believed. The Liberal Party has been sponsored by and beholden to big business interests. In my view, it’s time to re-balance the influences that drive government in British Columbia. It’s time for ordinary people to have a dominant say in public affairs. Office of the Police Complaint Commissioner. More importantly, the responsibilities of individual MLAs should be enhanced through meaningful use of committees and public hearings. Blogs like this one and others like it would be less needed if citizens had an accessible method of speaking about public policy or if the mainstream media cared consistently about the public interest. Both you Norm & Alex have been on fire lately. Keep up the great work & we will continue to promote your site…. it's where those who want the facts come to…. like Alex.. you make News as oppose to those slack asses in the MSM who just report the News. Hmm… your graph looks like the BC debt record, Norm. Are you and Christy working in concert? Before I press “print,” does anyone else have names of prominent (as in well-read and near-daily) bloggers that I have missed? “Main Stream Media Letting You Down? is as savvy as they come. He's been a go-to guy, along with Bob Mackin on fraud in the gaming trade, Pavco, LDB and many other issues. RossK of The Gazetteer provides eclectic information, always based on high principle. Blog Borg Collective mines the libraries of public information and often reveals information that no one else connects as important to public affairs. There are numerous others, check out “My Blog List” on the left margin of Northern Insight. BTW, many of us were inspired or encouraged by Sean Holman, now on the journalism faculty of Calgary's Mount Royal University. There is a good degree of collegiality between bloggers. We don't compete maybe because there is no financial prize. We encourage scrutiny of public affairs from all points of view, as long as those are principled views, not idiotic shilling, something that a platoon of paid Liberal operatives provide. Yes.. yes.. yes .. Learn from exemplars ! Promote or Reflect that special stuff that exemplars have.. whether great insight, curiosity, priceless knowledge.. or just a lovely way of being.. I think you should explore your views more.. start more fires.. or perhaps 'lighting beacons' is a better term. What is an aggregation of such blogs? – A boisterous living healthy conversation ? A Council of Drumbeats ? – Idle No More, mounts up and rides via Twitter, Indy blogs, websites, word of mouth, small scale community connection.. Idle No More dominates the consequential media currently .. a clear exemplar movement for people, family, culture, environment, fairness and honesty. Your comment re 'the next administration – rules by which etc' is a great example of how your blog can communicate and influence mainstream media. I want a new government to stop ridiculous high salaries in the public sector. Massive payouts when they leave whether they were there one year or five. I want a new government to hold those accountable of acts of treason and crony capitalism that have cost us billions of dollars. I want to see these thieves in jail and stripped of all their assets. I love your blog Norman, thank you so much. And, I thank you in return. Readers exercising intelligent examinations empower this blog and others like it. Thanks for the comment. When it first came in, I thought it from a Liberal shill with similar name who is active in social media. I was a bit confused and made a comment that is now removed. Proof that I should not jump to a conclusion. I wish I had seen the comment ! Especially if well deserved.. And would take it to heart. which suggested I slow down, consider and research, inform myself .. learn.. proclaim more carefully.. I thought my comment was lumpy.. but it was a response to your blog.. which had really stimulated me.. But to me.. the takeaway lesson is .. That your blog article challenged and reminded me to think, consider.. support .. promote..
.. and that there's so many – exemplars – just – like – you ..
Glad to see the graph and how readership is on the rise steadily. The reasons are obvious, you speak truths and always back it up with proof. The government always speaks in lies or half truths and refuses or even hides evidence that could povide truth, quite a contrast. MSM well they don't care about truth so don't concern themselves with that nasty factor. At any rate many,as I, have found that your blog and others have become a place of trust to keep us informed and show us the reality so elusive mainsteam and I only believe this will grow as your chart shows to a point where changes will have to be made if MSM is to survive. Thanks Don. As AGT mentioned recently, it is a chore for 1-person operations to offer regular material that, while opinion, is opinion based on researched fact. I say repeatedly to readers that I'm happy if you argue that my opinions are wrong but I hope you cannot argue that the facts I base my opinions upon are wrong in material ways. For every hour that we write, we spend many hours reading and researching. Yeah, being informed is a hobby but we hope it is worthwhile to fellow citizens. I thank you for regular contributions. The site becomes more worthwhile when readers offer their opinions. Norm…, you, AGT, Laila, Bob, Ian and other politically astute bloggers, have opened the door for the “average joe”, to engage in political discourse, on a wide range of topics. This is a great thing for “grass roots” political involvement. We need more open discussion in this country as a whole, to revitalise a stagnant, archaic and “infected” system of governance, in BC and Canada. I would add a few other items to the list such as a federal, and or provincial, Anti corruption commission, similar to Quebec's, (especially needed here in BC), along with a much revamped, Elections Canada, with greater powers to investigate and prosecute, electoral malfesance. We all need, to become informed and involved. After all, the current governments in this country seem to not be working in “Our” intrests, only their own, or their lobbyists intrests. Our kids and grand kids will thank us for it, in the long run. Feel free to include http://politicsrespun.org in the list. We're happy to be non-corporate media. And http://themainlander.com/ is constantly worth the read as well. Agreed. I'm a regular reader and pleased to know that many online journalists contribute to reasonable public dialogue. I like the idea of proposing solutions as you’ve mentioned so we don’t have to suffer for forever what is happening. We’d have to evacuate the planet if we don’t come to grips with this ruling social primitive. My view is it’s biological in nature so we need to have a conscious grip on things so we can have some reason to find a future with. They explain without any brains. Just a social without the truth. Why its like that ancient question.